Flexibility and full coverage aren't just for insurance policies anymore – they're crucial for carpet buying too (and a lot more fun to find out about). Buying a carpet can be intimidating. It requires commitment: it tends to be a small item neither in price nor in size. It can be something of an investment – but one which you’ll be in intimate contact with for a long time. You want a carpet that feels good under bare feet, that feels good to the bank account, and that you won’t tire of. Oh, and that doesn’t emit toxic fumes or do other nasty things to the environment. This is a lot of requirements for a rug, especially if you take the “not break the bank” aspect seriously. One solution (besides hardwood floors) comes from FLOR. 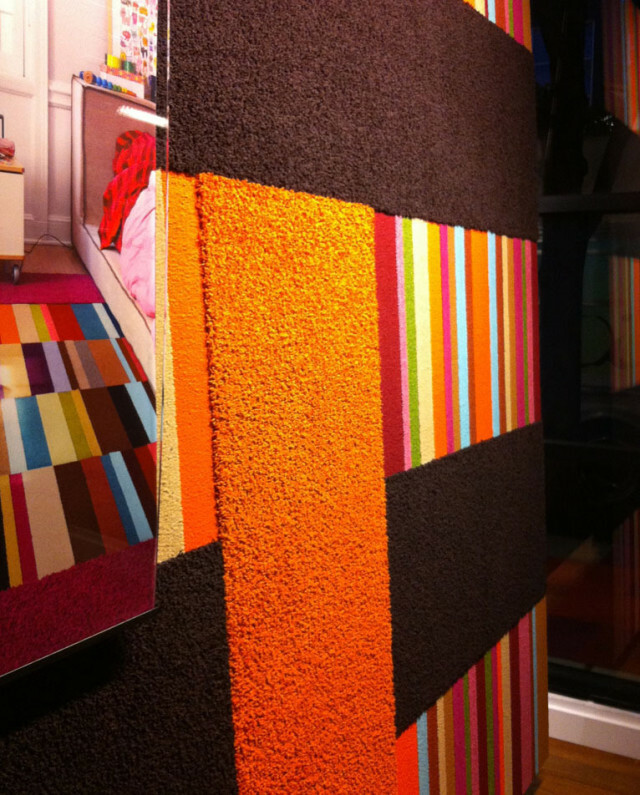 They’re a web-based, 10-year-old Chicago company that makes modular carpet tiles of such variety and with such intelligent design that you can find countless solutions to the carpet commitment problem. And they’ve just opened a store in Portland’s Pearl District. Stripes, solids, brights and bolds are all available. So are muted tweeds and Berbers and shades of beige, bone and oatmeal. 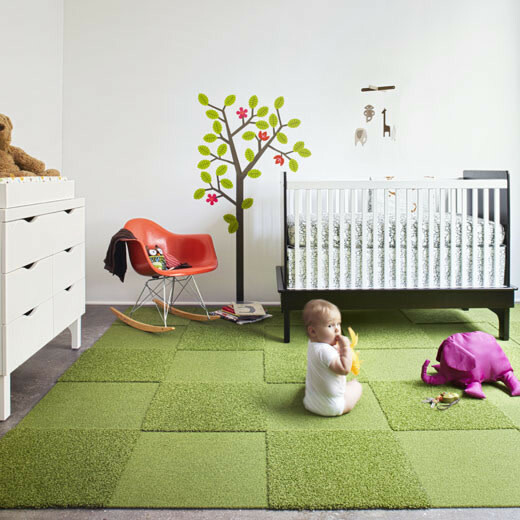 FLOR’s carpet tiles come in 20-inch squares that attach (and detach and re-attach) at your will, with little stickers that hold the tiles to each other without tacking them to the floor. The removable stickers take some of the permanence out of the commitment problem – you literally could rearrange multi-colored tiles whenever you wanted. And the price – about $15/tile for most of the nylon types (100% wool costs more) – makes the serious investment aspect/blow to the bank account much more reasonable than your average carpet option. You could live with kids and dogs and their attendant accidents and spills without worrying. Example: at the store’s opening the other week, there were several dogs in attendance (presumably shopping with their people). An accident ensued. The affected tile was simply unstuck from its neighbors, washed up, and returned to active duty in a jiffy, clean as new. The FLOR system might even save on therapy costs, it’s so easy. Too bad for Portland area counselors, but good for our quality of life. 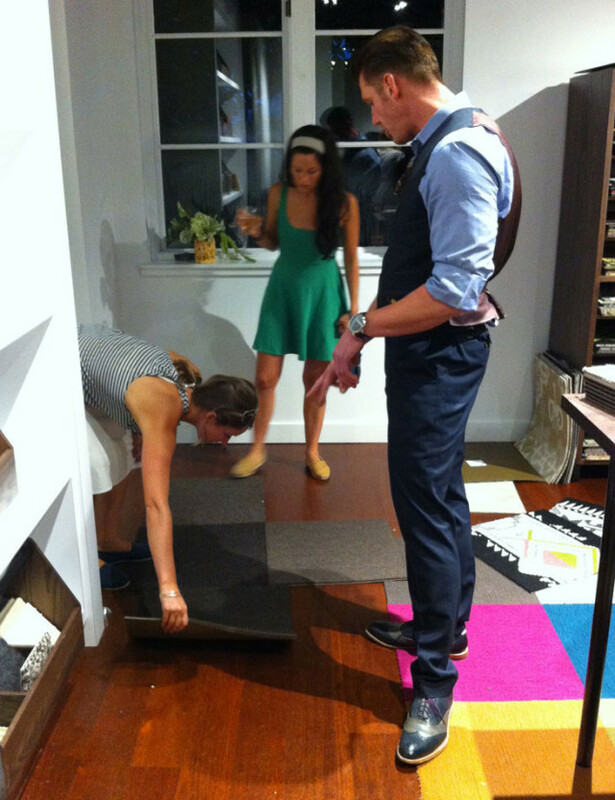 These folks didn't waste any time at FLOR's opening night August 30: trying out carpet tile configurations at the Pearl District shop, with help from manager Todd Jantz.